Nikolai Zherdev's offensive skills were on display in a 3-2 victory over the Atlanta Thrashers (who gave the Rangers all they could handle). Zherdev's hands in particular were on display in the 3rd period, when he backhanded the puck "where the peanut butter is", top shelf under the crossbar. Trust me when I say this, there are a few and far between who have this ability to handle the puck like Zherdev did last night. Not only did he score, but he also set up another goal when he showed patience, circled the net, and fired a pass through the crease. The pass ended up getting to Dan Girardi's stick - who pounded the puck past Thrashers goalie Kari Lehtonen. As usual, the King was solid in goal and the Rangers powerlessplay was in effect again (another 5-3, no goals). I know Zherdev's goal was on the powerplay, but really 14.5% is nothing to brag about. Another thing, why the lack of scoring at MSG? It's a mystery to me. 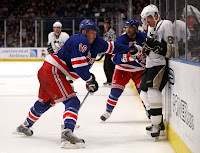 The game also featured a heavyeight bout, with the Rangers' Colton Orr squaring off with Atlanta's Eric Boulton. I was watching this game with my son and before the fight really got going, I blurted out, "Boulton's no push-over". I give Orr the decision, but both players stood up well in a long and tiring fight! Overall, the Rangers end up with another win and now have the best... that's right, the best, start for a Rangers team ever in franchise history. It's not always pretty for the Rangers this season, but in the end - the results are what counts. On to Toronto on Saturday, which will be another difficult one. Over and out! Oh, by the way, I will be doing the Quinnipiac Bobcats game on Saturday night. They play at home against the UConn Huskies. I will need a full report on the Rangers and will give my report of the Bobcats game. If interested in listening to the Quinnipiac game, tune in on your computer to WQUN Radio. The Rangers put 6 more points on the board for a total of 19 out of a possible 24 so far on the season. This past Friday night, the Rangers had a 3-1 road win in Columbus, led by Nikolai Zherdev’s 3 point night (1 goal, 2 assists) and the usual stellar play that we all come to expect from Henrik Lundqvist. The penalty killing was perfect (5 for 5) and they even added a power play goal (Dubinsky). The Rangers played almost a perfect road game, which I believe is important to establish if you’re going to become a good team. So far, so good. The game did feature what could have been a disaster for Coach Renney, when an errant Bluejacket players stick popped him pretty good and he went down for the count. We have a laugh about it now, but it just goes to show you how dangerous hockey can be at times! Maybe the coaching staff will come out with helmets in the future. One other thing… the penalties called in this game were a joke! Once again, the NHL’s tweaking at it’s finest. 14 minors for 28 minutes in a 60 minute game! That just makes me sick! The penalty on Colton Orr made no sense to me at all. The new NHL says you can’t interfere, so Orr dumps the puck in and gets shadowed by the Bluejacket defensemen. Then, somehow, Orr gets the penalty. You’ve got to be kidding me with these rules. I will not stop my constant hammering of the NHL’s meddling of a great sport. The win in Columbus set the Rangers up with a showdown with the Pittsburgh Penguins. I don’t want to complain too much, but honestly the Rangers received a little luck when Zherdev roofed one over Fleury’s shoulder with 8 seconds left to go in regulation (what a shot). Freddie Sjostrom’s goal in the shoot-out was the winner in a game where the Rangers were very fortunate to tie, let alone win. I know the shots were in favor of the Rangers (44-29), but the same old song is starting to play… where is the offense? Especially troubling is the lack of offense at MSG. I can’t figure it out, and neither can the Rangers. They must pick up their offense as the season goes on. Lastly, ah, nothing like the Rangers and the Islanders to quench a Ranger fan’s thirst. Especially when one is at the top and the other is at the bottom. The Rangers took care of the lowly Islanders, 4-2, in what is becoming a pattern lately. King Henrik was evenly matched by Islanders goalie, Joey McDonald, but in the end the Rangers outplayed the Isles when it counted. Led by Chris Drury’s 2 goal explosion, yes… that Chris Drury who is heavily counted on for not just his leadership - but his offense as well. Hopefully this is a good sign for things to come for Drury’s game. In a game where, let’s face it, I’m gonna beat a dead horse… but I can’t help it. The officiating was once again dubious, to say the least. For both sides. Does Gary Bettman watch these games? Does he see how ridiculous the new rules towards penalties look? I don’t think I’m the only one who’s absolutely astonished by the mediocre calls in the NHL season (and season’s past). It’s a joke. Well, the Rangers are 9-2-1 after 12 games… who would of thought? Even though I believe they have some glaring weaknesses, I have to tip my hat to the players, coaching staff, and management. This start is one of the best starts ever for a New York Ranger team in all of their fine history. As the saying goes, “Let’s-Go-Rangers”! Over and out! First, I would like to thank everyone for the kind words and support during these tough times. For those who know and don't know, my father, Mike Kotsopoulos, passed away on October 9th at age 76. I don't want to get into too much detail, but a great man has left us. My mother Frances, my sister Neva, and myself would like to thank everyone for the support we have received during these trying times. Now, let's talk... or really get me up to date with our beloved Rangers. I really didn't get to watch any games other than the loss to Dallas and the shoot-out win against Toronto since the Europe trip. With a 6-2-1 record after 9 games in such a short span, I can't complain. I really have to rely on my fellow Rangers fans to give me the total "scouting report" on what's gone on in the last 2 weeks. I mentioned earlier that I did see the homecoming of Sean Avery and it sure looked to me that the team and fans have moved on. Overall, the effort was less than inspiring in the loss to Dallas. Could it be that the schedule has caught up with the players a little? Probably. They get a nice rest until heading to Columbus on Friday. So far you've got to like what Glen Sather has put together. Getting off to a fast start was very important. With 1/8th the season almost gone, you have to like the team's make-up. I still believe that there will be some fine tinkering along the way and when needs are evident - Sather will act. Other than that, I need some feedback as to what went on over the last few weeks. Looking forward to your responses... over and out! The New York Rangers embarked on a European trip and conquered all. First, they took 2 games in the pre-season finales against SC Bern & Metallurg Magnitogorsk. Then, the real games began. The Rangers, not without a few weaknesses, gutted out 2 victories over the Tampa Bay Lightning - both by the score of 2-1. You definitely gotta tip your hats to the Rangers efforts. They outchanced, outhustled, and really outplayed the Lightning over the course of the 2 games. A couple of quick observations from the games: The Rangers are fast! They are much faster than I originally thought they'd be. The level of speed that the Rangers showed is going to be real tough for opposing teams to deal with. Another thing that I noticed was the defensive smothering of Tampa - it was excellent. Sure, Tampa had opportunities, but Lundqvist was there when needed. Overall, they really outplayed Tampa, big time. I think this team is obviously a squad that is a work in progress. But how does one complain about taking the first 2 games of the regular season? I mean, you can't improve on 4 points in 2 games! It was "pretty" at times during these games, but with a little ugly thrown in as well. I could nitpick about the lack of scoring, or the numerous giveaways inside the Rangers blueline, but in the end there's an old saying in hockey - "You don't draw pictures on a scoresheet"! They came, they saw, they conquered... it's that simple. On another note, I caught Barry Melrose's press conference after Game 2. Boy, was that a beauty. The Tampa players, especially the high priced ones, have been served notice! I played for Barry in my last year of professional hockey, I believe he's one of the best coaches that I ever played for. Barry will let you know the good and the bad. If you don't play the way that he expects, you will sit - trust me on that! I trust that Barry will turn it around in Tampa, but the players better beware. Over and out!